My name is Mark A. Wilson and I am the Lewis M. and Marian Senter Nixon Professor of Natural Sciences and Geology at The College of Wooster. This is my teaching and research website. Please use the tabs above to navigate between pages. I am an invertebrate paleontologist and a sedimentary geologist. 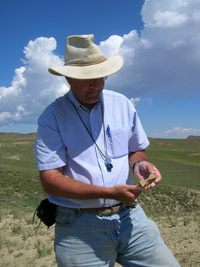 I earned my PhD in paleontology from the University of California, Berkeley, and have been blissfully teaching at Wooster since 1981.